World War II war hero Doris “Dorie” Miller was born in Waco, Texas on October 12, 1919 to Conery and Henrietta Miller who were farmers just outside the city. Miller grew to 6 feet 3 inches, weighed over 200 pounds, and played football at Waco’s A.J. Moore Academy. He dropped out of school at the age of 17 and enlisted in the US Navy in 1939 at the age of 20. He was made a mess attendant, one the few positions available to African Americans at the time. Miller was eventually elevated to Cook, Third Class and assigned to the USS West Virginia stationed at Pearl Harbor, Hawaii. Miller was doing laundry as a mess attendant aboard the West Virginia on December 7, 1941, when it was subjected to a surprise attack by Japanese forces. After hearing a loud and urgent summons to battle, Miller, who made his way from below deck to the ship’s bridge, saw Japanese fighter planes attacking US Naval forces, and the harbor already engulfed in flames. He ran to an antiaircraft station, only to find it shattered by a Japanese torpedo. Miller then pulled a captain and several of his crewmates to safety under heavy enemy fire. After making sure that his fellow sailors were out of harm’s way, Miller returned to the bridge, secured an unattended 50-caliber anti-aircraft gun, and began firing at Japanese warplanes. Although he had no previous training in operating the weapon, by the end of the attack he managed to shoot down at least two, and perhaps as many as six, Japanese aircraft. “It wasn’t hard,” Miller recalled, “I just pulled the trigger and she worked fine.” Once Miller ran out of ammunition, he was ordered to abandon ship. Although Miller’s courage under fire was initially overlooked, the black press seized his story and pressured the Navy to recognize him. On May 27, 1942, Admiral Chester W. Nimitz honored him by awarding him the Navy Cross, the third highest medal in the Navy. The Navy then promoted Miller to Cook, third class and moved him from the laundry room to the galley. 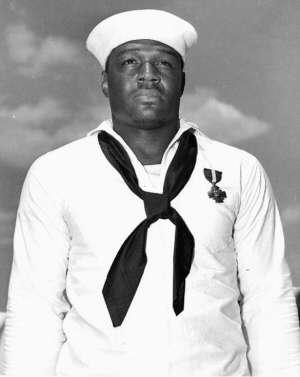 During the spring of 1943, Dorie Miller was assigned to the Liscome Bay and was still serving as a ‘messman’ on the warship, despite his previous heroism, when the carrier was sunk in the Gilbert Islands (now the Republic of Kiribati) on November 24, 1943. At the time of his death Miller was 24. In addition to the Navy Cross, Miller received the Purple Heart, the American Defense Service Medal – Fleet Clasp, Asiatic-Pacific Campaign Medal, and the World War II Victory Medal. In 1973, the Knox-class frigate USS Miller was named for Doris ‘Dorie’ Miller. Oscar-winning actor Cuba Gooding, Jr. portrayed Miller in the 2001 movie Pearl Harbor, and in 1991, the Alpha Kappa Alpha Sorority dedicated a bronze commemorative plaque of Miller at the Miller Family Park located on the US Naval Base, Pearl Harbor. Darlene Clark Hine, William C. Clark and Stanley Harrold, The African American Odyssey, Combined Volume (New York: Prentice Hall, 2003); Matthew C. Whitaker, Peace Be Still: Modern Black America from World War II to Barack Obama (Lincoln: University of Nebraska Press, 2014).